Happy Friday! Man it's been a whirlwind week! I was in New York earlier this week for work, now i'm headed to Orlando today for a girls weekend (vlog to come!). I'll be out of commission through Tuesday since I'm taking a much needed, actual vacation. But I wanted to announce the winners for this Graftobian giveaway first! 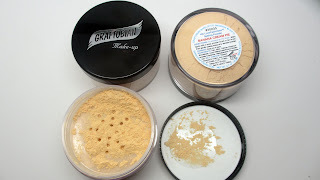 I'm giving away two of these amazing powders. If you like Ben Nye's Banana Powder, you'll love this! It's a very fine milled yellow powder that is amazing for setting highlight. I use it under my eyes, bridge of nose, and forehead to instantly brighten. Please email me by next Wednesday May 29th by Midnight EST to claim your prize or it goes to someone else! Stay tuned, more giveaways to come!